So far it had been a busy morning… They’d had to make arrangements for Red Crest, collected rumors in a bar, done Kevin’s usual child-collecting routine, visited the markets, created a small clan of dragons, launched a small partnership with the Smiths and Artificers Guild, dealt with some rampaging rabbits and a ferret pickpocket, escorted Ms Muirhead home, sent out some of his Thralls to get an outpost of feathered dragons set up, and would be getting directions to a few panther bandit camps… It was quite definitely getting to be time for lunch! Even a bit past! Now THAT was fast work. She’d only been on story duty for… well, OK, most of the morning. Getting up with the sun on a flat world did make for fairly straightforward days. Still, it showed a good deal of adaptability and some skill at quick surveillance. Not a bad approach to take on just three or four hours notice though. Silly Thralls… couldn’t they recognize their own power signatures? Ah. Their power signatures HAD looked a bit odd, but they’d figured that – in the worst case – it might be an elaborate rescue attempt, and Kevin had seemed to be planning on that happening and hadn’t asked them to stop it. At best, it would be what he wanted anyway. Oh well, they had probed her mind pretty thoroughly already and hadn’t really had any further use for her. Besides, they had planted a hidden set of smartfiber-tracers on her, and it looked like they were still broadcasting. Evidently they – and whatever group was behind them – really weren’t all that tech-oriented. Either the fibers had been removed all at once – and they weren’t reporting that – or she was now deep in the mountains outside the city. It was even possible that she was with the Panther bandits, given that the signal was coming from the right general direction, so they had the fibers burst-transmit their recorded data to the Thralls back at the ship for a bit of analysis. With the crew stocked up with local magic and the ship resupplied, and their personal shopping done, there need be no further delay about lunch! Marty had one of the Thralls with Divination locate some of the best food around. After all, you couldn’t entirely trust the local restaurant ratings; the best food liked to hide in little hole-in-the-wall specialty places! Hmm… The divinations indicated that the local restaurants tended to be vegetarian, omnivorous, or carnivorous, but a few of the higher class places – good enough to support multiple menus – served more varied customers. It wasn’t uncommon to bring people along, but – while it was nice to be seen hitting the trendy places with people in tow for all to see – sometimes the heads of the major Families would just go and sit at a fancy restaurant with some attendants while consulting paperwork. Meals were social events otherwise though, so it was normal enough invite people along the way… Trading meals could become a major social obligation in an of itself, although a sizable portion of the upper classes didn’t always engage in it. As for the best overall restaurant… It looked like that would be the Pasta Palace, at the top of one of the ridges overlooking the bay. Marty loved Pasta! And it was trendy too! Kevin sent some Thralls ahead to start setting things up and started looking around for some upper-class, or otherwise interesting, shoppers to take to lunch. That would be a splendid opportunity for anyone who wanted to get them more-or-less alone! Marty tried to count her tails, and could only determine that there were a lot…. they waved and flowed most hypnotically, and he found himself just watching them move. Counting them proved to be quite impossible! Marty had had no idea that he was this into foxes! Well, to be fair, it was more the motion of the tails themselves that seemed to be hypnotic as opposed to any sort of attraction. The otters and the beaver came along readily at the idea of someone else paying for lunch. The Fox Lady, however, turned to them as they approached. Her look was a bit disconcerting as she gazed upon each of them in turn. Marty promptly concluded that his count should have been “somewhere between eight and nine tails” – and that meeting this particular lady was not exactly an accident. She might well have wanted to get a look at the new disturbing factor in “her” city. Fortunately, the delay in walking there had covered a good deal of the setup time – and Marty was pleased anyway! You knew that it wasn’t a real chef or a top restaurant unless they fussed, complained, and made you wait to eat! He’d learned that from Abigail! They were seated the moment they arrived, and the scene over the handrail down on the city and bay below was superb. The sailing ships coming and going were readily visible, and quite enchanting. Marty winced a bit though as Kevin – as a not-quite-adult wolf – basically set about ordering “lots”, along with wine, and cheese sticks, and the best ale, and meat and sausage sauces, and more cheese, without a care in the world for his digestive tract! A good thing for Kevin that his body always reverted to his original, Core-tailored, form… Well, at least he was ordering plenty of everything that the others might want, and lesser meals for the servants. He had wine and a nice big bowl of fettuccine with bread sticks. He wanted to maintain SOME dignity, and it wouldn’t do to have sauce all over his feathers! Kevin, of course, assumed that the sauce wouldn’t DARE get on him! And, if it did, that was what molecular telekinesis was for! The conversation was light, although the Otters and Beaver were obviously awed by their other guest – which pretty much confirmed her identity. Kevin, at least, knew that he only kept helping people because it improved his reputation and let him attract more Thralls! Hm. There was some deeper arcane injury there or some mystical principle at work. The local magics were more than up to fixing such a minor injury if it was purely physical. Hmm… It looked to Kevin like inquiring about her main objective would be considered rude by local standards – but probably not by her. It looked like she was more open minded regarding curiosity and such than the typical native was. The sabbatical journeys were proof of that much. Hey, dessert time! Pastries, with lots of cream and butter and mixed-meat fillings for the carnivores! One of the advantages of the unchanging body… No worries about calories! Marty preferred fruit and nuts, so he could show off how much control he had over his beak! Spiritual wounds. He hadn’t run across many of those. Well, there were at least three ways around that sort of thing; spiritual regeneration, a god of healing, simple raw power. He might have the raw power, but healing was just not his thing, which would seriously weaken any such attempt. Obviously enough, consulting a specialist was in order. Perhaps the Jewish Heaven again? Raising dead spirits out of Sheol would seem to be a bigger trick! And they could check on Menthas while they were there! She should be well enough to have visitors by now! That would be the longest project. The Otters were a pair of ship officers on leave between voyages and had ben presented with some fine wines and tickets to several good shows. The Beaver was a shipbuilder working on a new ship design. Marty had been quite interested in that. The ship design he had in mind was going to be using a particularly dense wood recently found floating in the waters to the far west. Despite being immersed in salt water without any sort of preservation treatment for weeks (or perhaps months or years), the stuff had proven incredibly hard and durable. It was forcing a number of changes in his assumptions in shipbuilding. Getting someone to fund the construction was proving to be an issue, but since the design was still very rudimentary that isn’t as much of a problem. He was hoping the design and construction of such a shop would certainly get him promoted to a Master Ship Builder within the guild. Marty had arranged to fund him. It sounded like fun (and like the local equivalent of an iron-hulled boat), and he couldn’t let Kevin make all the trouble now could he? Still… based on what he could recall of the prices back on the market and how much of the wood he was going to be needing, the ship was going to require pretty much buying up the entire supply. That would cost a modest fortune – far too much for building such a ship to be likely to be profitable. Still, the fact that they were finding all of the stuff floating on the open sea was a bit odd. Either gathering it directly, or finding the source, would be far more efficient. Kevin noted that dense wood suggested limited flotation, and the great tolerance for seawater suggested either growing near the shore – possibly something like a mangrove – or actually growing on the bottom of the sea. Well, if it did, their smartclothes would let them reach it easily enough – but it would be a lot of work. They let the Otters and the Beaver out first – no sense in blatantly asking for attention – and set up their gate inside. The magic needed to be augmented with a bit of mana to reach beyond the local realms – well, the anthropomorphic realms WERE pretty isolated – but that was no problem. Kevin made a minor effort to hold down the power-signature, but didn’t strain at it. Part of the point was to be noticed after all. The lightshow still attracted a good deal of attention as Kevin opened the gateway. The Fox Lady stopped to analyze it for a moment. Anahel looked up at them after a moment. (Anahel) Ah, welcome back to the realm of Shehaqim. What can we do for you today? Marty and Kevin made a note of the name. Marty had to say, anything to do with the WWII era was usually nasty. They provided Ms Istral with some explanations. She’d been trying to analyze the local structure and had been finding the place more than a bit hard to fathom. Benjamin brought his hands up, as if in prayer. 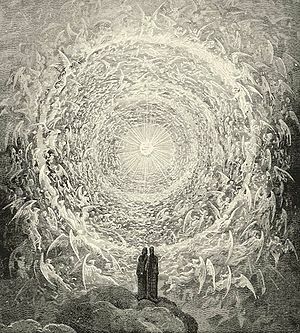 A bright circle of light surrounded them and flashed. As the light died away, they found yourselves in a large pagoda overlooking a lake. The serene atmosphere of the place lightened their moods – and they found themselves feeling better both physically and mentally. Kevin found the sweetness and light that saturated the place a bit cloying though. Fortunately he had his inner evilness to console him! Marty had to wonder… This seemed more like Buddhism than old testament to him. Still, a healer could be expected to cultivate serenity. Up ahead there was an angel lecturing a number of priests, doctors, and healers while gesturing at a transparent display of a human next to him. He seemed to be giving lessons on healing and the different aspects of the body, mind and soul, how they interacted, and why throwing more power at some injuries was not the best way to approach some problems. Kevin sighed. Sometime it felt like the entire cosmos was out to tell him that he was NOT in charge of things. Marty quietly took Ms Istral over to Raphael, while Kevin hung back behind him – since he didn’t really want to get used as an example. His demonic darkness was personal! Marty was fairly sure that the Archangel had enough discretion not to do invasive examinations in front of lecture audiences – but Kevin figured that they’d probably consider him an underage child who was trying to avoid treatment for a psychological problem! While that might be at least partially true, it was still undignified!